I don't know what I expected from Fuller House, but it blew away whatever those expectations were. I had no idea if this show would click with me... but it definitely did. It's weird in a way because it's a 90s show made in 2016 through and through. The production values and topics have been updated but the characters and the structure of a given episode feel straight out of the 90s. It's basically the same show as the original Full House... but somehow it works. It just works. I was a TGIF kid. If you don't know, TGIF was a block of shows that aired on prime time every Friday night. Most people from my generation would tune in for at least one show in the block, if not all of them. I remember many Friday nights ordering pizza and watching TGIF. 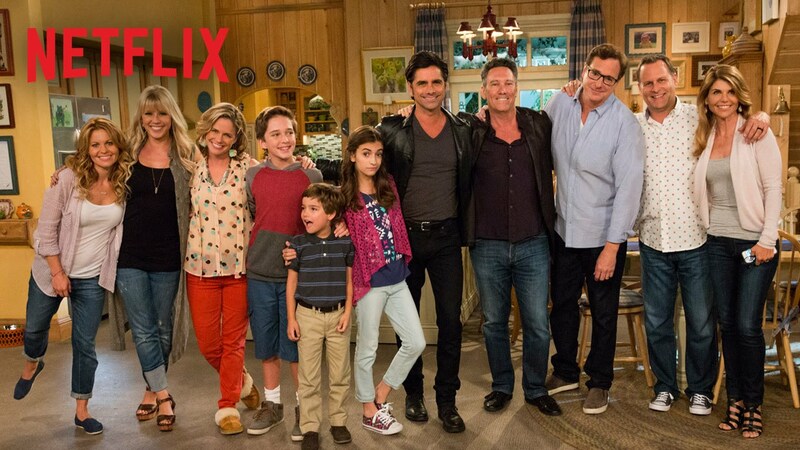 Fuller House sees almost the entire old cast return to make cameos and be part of the story. But the new main cast of the show are three of the kids from the old show (played by the same actors) and their kids. DJ has grown up, gotten married, had three kids, and then her husband died. Kimmy is still her best friend and has a kid of her own with an ex. And Stephanie is the cool aunt who decides to move in with all of them to help out. DJ's three boys and Kimmy's daughter are all new actors but they definitely fit into the show seamlessly. I'm sure part of what sells the premise is that the show isn't afraid to make fun of itself or mock it's previous 90s-ness. It's so well done. I just love it. My wife and I watched the entire season in two sittings and immediately wanted more. 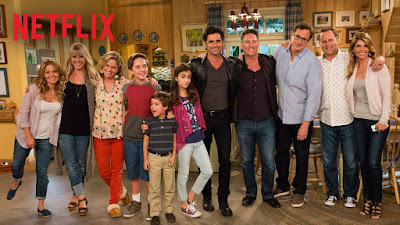 I guess we're not the only ones since Fuller House was already renewed for a second season by Netflix. If you were a kid in the 90s and watched Full House you absolutely need to watch Fuller House. If you never watched the original show I'm not sure if you would get the same joy out of it that I did... but it might still be worth a shot. I just know that I'm really excited to get a second season soon! I've seen a lot of hate and snide remarks about this show, but I thoroughly enjoyed it. As you say, it's totally a 90s show. It's full of corny jokes and takes place in a magical world where everything revolves around the Tanners (Fullers, now I guess), and single mothers live in multi-million dollar SF houses, but I still really liked watching it. The only problem I have is that my tolerance for annoying, cloyingly cute, child actors has gone way down since the original aired. Yeah, the overly cute kids get a bit annoying. I find myself relating to DJ the most now... but I'm married with two kids so I suppose that's not surprising. I remember watching this in the 90s and relating to the kids. It's an interesting shift. I loved the over the top cheesy. It's just such a perfect fit for the show. And all the digs at the Olsen twins were great too!